The problem being a solid Dredd rather than a great Dredd. Oooh, that's a good'un alright. 654 for me too. Wagner & Ezquerra Dredd. Song of the surfer. Dead Man. Horned God. Zenith phase 3. Wow. Yep that's a strong call. Off the top of my head - was that the wrap-around Slaine-lifting-a-horse-with-his-legs cover? Oh Grud, now I don't know what to think. 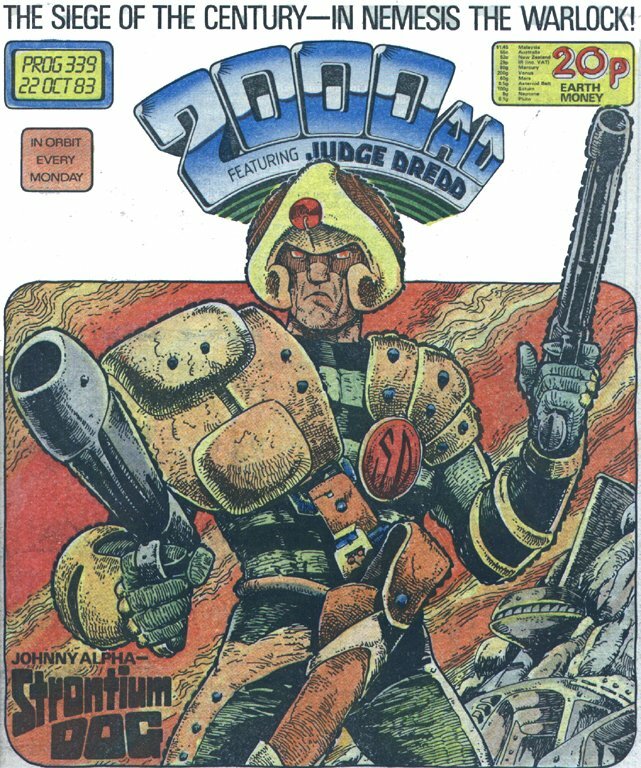 For Best Prog Ever I'm usually tempted to say one of the Judge Death Lives progs (222-228) - maybe 228, with the start of Rogue Trooper as well as Nemesis Book I and Strontium Dog (The Kid Knee Caper). Though of course it does carry Mean Arena. Yep 222 to 228 is hard to beat. I would also throw 178 into the mix. And I still have the Dredd badge. Selecting best prog ever is an impossible task. All I can say is that I see its more periods of up and down and we are in the up period. For me personally this year has been great. Prog 2100 is an awesome jump-on prog. could anyone please let me know which post-Trifecta stories I need to read, at least in summary? Ta. and that is what I am planning to do. I think you should also read The Family Man from Megazines 312 and 313 (it is also in the Trifecta Mega Collection volume). sorry couple of mistakes above, now corrected. 2100 has truly excellent Dredd, Fiends and Brink. Siege of the Century in Nemesis? Must be the centrespread of Yggradsil! Good candidate!